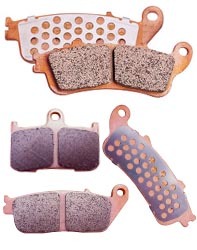 The EBC HH brake pads offer the highest friction rating for MAXIMUM stopping power. They are made from Sintered copper alloy for longer life and perfect braking under all riding conditions, wet, dry, hot or cold. Where required, unique STAINLESS STEEL radiator plates are fitted to reduce heat transfer into bikes hydraulics. The EBC unique “Double Segment” VENTED design keeps pads cooler and prevents pad drag, overheat, and fade. Pads range in price from $30-36 on sale usually. Single pad per piston sets are usually $45-50 per caliper. Organic asbestos free, molded friction material designed for use in heavy duty and off-highway motorcycle applications. 30% copper by weight added makes this a high copper pad close to sintered durability levels. It has a medium-high coefficient of friction (μ) which retains a highly effective braking performance over a wide range of operating temperatures. This material offers stable braking with minimal pad and rotor wear, and minimal dusting of wheels.